It’s been a while that i’ve been quite intensively playing with Deep Learning both for work related research and personal projects. More specifically, I’ve been using the Keras framework on top of a TensorFlow backend for all sorts of stuff. From big and complex projects for malware detection, to smaller and simpler experiments about ideas i just wanted to quickly implement and test - it didn’t really matter the scope of the project, I always found myself struggling with the same issues: code reuse over tens of crap python and shell scripts, datasets and models that are spread all over my dev and prod servers, no real standard for versioning them, no order, no structure. So a few days ago I started writing what it was initially meant to be just a simple wrapper for the main commands of my training pipelines but quickly became a full-fledged framework and manager for all my Keras based projects. Today I’m pleased to open source and present project Ergo by showcasing an example use-case: we’ll prototype, train and test a Convolutional Neural Network on top of the PlanesNet raw dataset in order to build an airplane detector for satellite imagery. This image and the general idea were taken from this project, however the model structure, training algorithm and data preprocessing are different … the point of this post is, as i said, to showcase Ergo with something which is less of a clichè than the handwritten digits recognition problem with the MNIST database. Now it’s time to grab our dataset, download the planesnet.zip file from Kaggle and extract it somewhere on your disk, we will only need the folder filled with PNG files, each one named as 1__20160714_165520_0c59__-118.4316008_33.937964191.png, where the first 1__ or 0__ tells us the labeling (0=no plane, 1=there’s a plane). We’ll feed our system with the raw images, preprocess them and train a CNN on top of those labeled vectors next. model.py, where we will customize the model. These files would be filled with some default code and only a minimum amount of changes would be needed in order to implement our experiment, changes that I already made available on the planes-detector repo on GitHub. The format that by default Ergo expects the dataset to be is a CSV file, where each row is composed as y,x0,x1,x2,.... (y being the label and xn the scalars in the input vector), but our inputs are images, which have a width, a height and a RGB depth. In order to transform these 3-dimensional tensors into a flat vector that Ergo understands, we need to customize the prepare.py script to do some data preprocessing. This will loop all the pictures and flatten them to vectors of 1200 elements each (20x20x3), plus the y scalar (the label) at the beginning, and eventually return a panda.DataFrame that Ergo will now digest. This is not a post about how convolutional neural networks (or neural networks at all) work so I won’t go into details about that, chances are that if you have the type of technical problems that Ergo solves, you know already. In short, CNNs can encode visual/spatial patterns from input images and use them as features in order to predict things like how much this image looks like a cat … or a plane :) TLDR: CNNs are great for images. Other than reshaping the flat input back to the 3-dimensional shape that our convolutional layers understand, two convolutional layers with respectively 32 and 64 filters with a 3x3 kernel are present, plus the usual suspects that help us getting more accurate results after training (MaxPooling2D to pick the best visual features and a couple of Dropout filter layers to avoid overfitting) and the Dense hidden and output layers. Pretty standard model for simple image recognition problems. We can finally start talking about training. The train.py file was almost left unchanged and I only added a few lines to integrate it with TensorBoard. 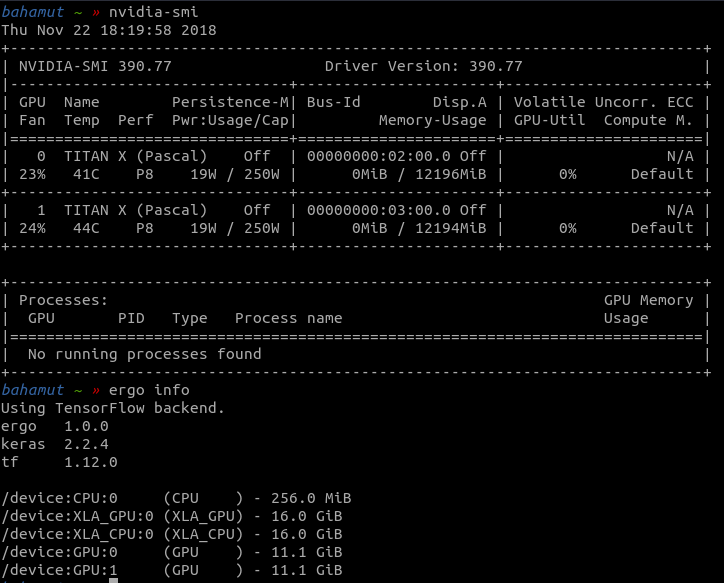 If running on multiple GPUs, you can use the --gpus N optional argument to detemine how many to use, while the --test N and --validation N arguments can be used to partition the dataset (by default both test and validation sets will be 15% of the global one, while the rest will be used for training). Not bad! Over 98% accuracy on a dataset of thousands of images!